You've spared no expense to make sure your state-of-the-art studio or home cinema is designed to offer the most realistic experience. Ceiling, walls, doors and floor systems have been designed to achieve a minimum STC (Sound Transmission Class) performance rating of 60 and IIC (Impact Isolation Class) of 55. HVAC ducts were designed to make sure ambient noise levels within the room are quiet to an NC (Noise Criteria) rating of 20. You've crossed your T's and dotted your I's, there's nothing left to do... Right? Wrong! The fun is just about to begin because what happens in the field will determine whether all your hard design work will pay off. Planning to reduce potential field problems before they happen is your key to success. So what more do you plan for? First, plan for flanking noise and second, plan for the trades in the field to work as they usually work. That means that if you want the various trades in the field to work together and do what needs to be done, you must provide clear and concise information and instructions (both visually and verbally) to help them through what will probably be a new and atypical construction process for them. It is important that all the trades are on the same page and understand what the goal is. Express to them how important their skill and care is in accomplishing the goal. Ask them to review the scope of work in advance and to ask any questions or concerns ASAP. 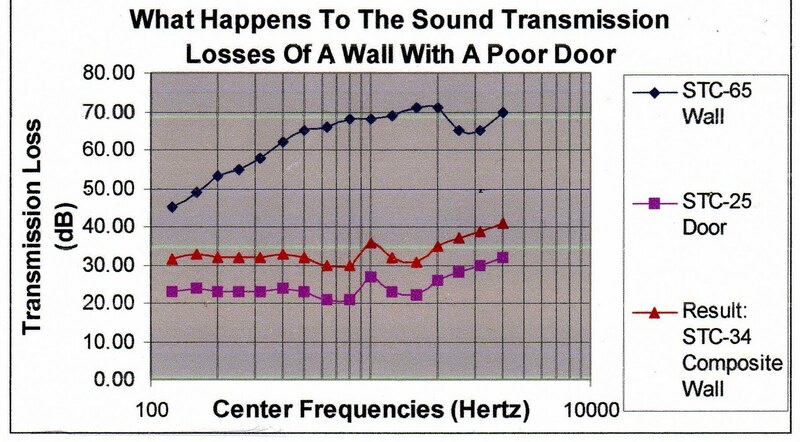 Poor caulking around the frame of an acoustical door, or along gaps at the floor plate can cut a high STC door or wall system in half. If a high STC wall assembly is built over an OSB or plywood subfloor, the performance level of the wall will (as a result of flanking noise) typically never achieve an STC rating above 50. 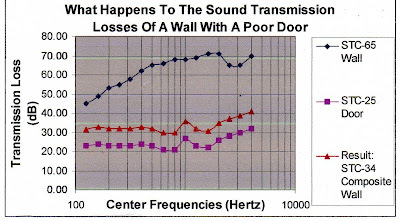 The improper installation of plumbing lines through wall studs and ceiling joists can take the room's ambient noise level from a quiet NC 20 to a distracting NC 40. Lined duct runs alone don't assure a quiet environment. Typical HVAC installations can be very noisy even with lined duct runs. The fanciest electrical system cannot deliver instantaneous and continuous current, and will be susceptible to noise, if there are any connections along the path that are not clean and tight. It is attention to detail that you must rely on from each of the trades in order achieve the invested potential. Dynamic range and low-level resolution are only as good as the noise floor allows. Give the construction trades good information and they can give you the desired results. Record companies say CD sales are down this year another 15%- down 50% since 2000. I think there are two primary reasons for this; today's music to too cheap and CD's are too expensive. Not considering rap ('cause it's not worth considering), you wouldn't believe how many pop recordings today are entirely, or almost entirely, "built" with programed samples, loops and plug-ins. They contain no interesting nuances, no personalities, no real life. The stuff pushed by the record companies today is of such simplicity it's insulting. It's no wonder most of the music produced today is discarded tomorrow. Today's big record companies are not like they were in the 60's. The lack of talent, along with a structured environment that supports the growth and development of artists, are why we have such a homogenized top 50 offering today. I looked at Billboard's top 50 for the week and found 3 artists who I think have been making music for about 10 years, 42 we will likely not hear from again after two years, but most interesting is that there are 5 artists in the top 50 who have been making the charts since the 60's. What does that say about the record companies today and their commitment? The world population has more than doubled since 1960. No doubt there is more talent available today than there was in the 60's. With twice the talent, twice the consumers, and many times better means of distribution, what would be the reason for declined sales? The problem lies with the record company's desire to get in, get out, and move on. It's a "drive-through" mentality. People will eat fast-food, not for the enjoyment of the palette, but as a quick filler for the stomach. However, most would select filet mignon over hamburger when given the choice. There is more to it. More smells, flavors and textures, more intrigue and complexity. A bit more left brain fun. The general population would certainly develop more sophisticated tastes in music if given the opportunity, but for now, the record companies are in the fast-food business. They don't like risk and they don't have patience. They like repeating simple, proven recipes that include cliche's, which help to mask the cheapness, much like salt and sugar does for a Big Mac. Forget about interesting melodies, rhythms, harmonies, tones, not to mention humans expressing themselves with physical instruments. Add to this the high cost of a CD (which may only have two songs that you really want). Why are they marked up so high when recording studio rates are the same as they were in the mid '80s (yet their overhead is certainly not) and they cost so little to manufacture? No wonder people prefer to download singles. It takes the place of 45's. CD's costs the consumer the same whether it was cheap to produce, or expensive. We have better quality, low cost electronic instruments that did not exist in the 60's. We also have an amazingly affordable digital recording medium available to the masses that have advantages over previous equipment that only companies could afford to purchase. This should result in some really great recordings, right? The problem now is lack of training in how to produce, record, mix and master. Where would The Beatles be if it weren't for the likes of George Martin and Geoff Emerick? And what about the sound quality of the mediums? Well, it's worthy as a separate topic, but suffice to say, MP3 (1/10th the data of standard CD) heard through ear buds is not very inspiring. Yet this is common place among young people today, while they are multi-tasking! Generally speaking, the quality of the song writing today is lower, the quality of talent is lower, and the quality of recording process is much lower. Many of the hits today don't even use musicians. Programed music saves a ton of money for the record companies, but at the expense of the soul of the music. We have high quality, extremely affordable digital technologies available to operators who are uneducated regarding best practices. I believe that if consumers were offered real meat for the same cost as the junk food they are currently being fed, they would discover they like many other foods, which would boost CD sales. People tend to gravitate towards quality, and quality always outlives cheapness. AV RoomService just sent out our Acoustic Tips Newsletter Vol.6 Issue 3.